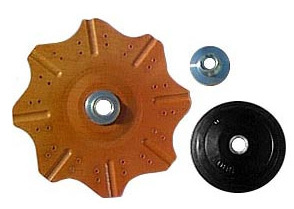 Sav-A-Disc is a patented grinder backing plate and grinding system that significantly increases abrasive disc life and improves the quality of any surface preparation or finishing project. SAV-A-DISC BENEFITS . . .
Longer Abrasive Disc Life – Sav-A-Disc increases abrasive disc life a minimum of 20% (some tests have shown an increase of 300%), compared to other backing systems. Better Quality – Because the Sav-A-Disc spins freely when compare to the abrasive disc, hang ups and snags are virtually eliminated. Additionally, finer grits can be used which will reduce gouges, digs, and waves. Greater Productivity – The decreased frictional surface area of the Sav-A-Disc creates less heat. The scalloped plate edge pulls air under the disc cooling the disc and operating area. The moving air lowers temperatures prolonging disc life. The lower temperatures allow greater tool speed and faster work. Longer Tool Life -Because the Sav-A-Disc requires less pressure, tool bearing life is increased.